The Greater Bandon Association has named the June recipient of its Volunteer of the Month award. Terrie Loomis becomes the eighth winner of the award. 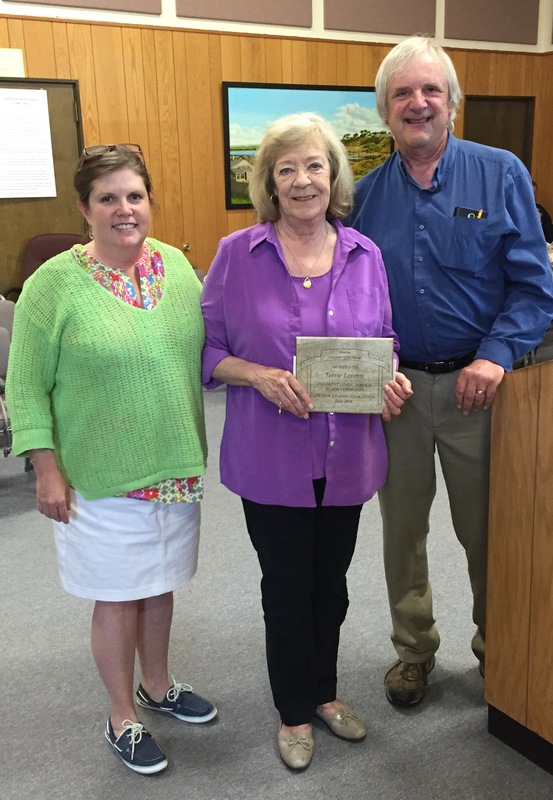 She was presented the award in form of a plaque and a gift certificate donated by Esscents Candles and Accessories at the June 6 meeting of Bandon’s City Council. While the Chamber of Commerce does a wonderful job of recognizing its own volunteers, many of our residents don’t always fully appreciate the service that these volunteers provide for our community. For visitors and newcomers to Bandon, the very first person they often meet and that can make an impression about our community is the volunteer at the Visitor Center. For the new business opening its doors in Bandon for the first time, it is the volunteers who are helping with the ribbon cutting. In her role as volunteer assistant to the director, Terrie stands ready to help at the Chamber at any time and is ready to help wherever they need it. She retired after 15 years of teaching at Ocean Crest Elementary School and began volunteering at the Chamber in 2003. She helps with everything from hanging holiday lights to conducting research. For example, it is Terrie that is on the receiving end and who is replying to those e-mails requesting help through the Chamber website. The Greater Bandon Association will be honoring one of Bandon’s many volunteers that are making a difference in the community each month. Nominations for the June Award should be e-mailed to harv@greaterbandon.org or mailed to P.O. Box 161 by close of business on June 30.